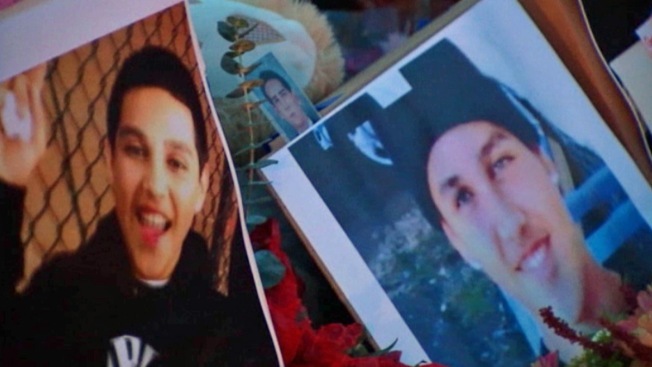 Images of Andy Lopez seen in this photo taken at a memorial site in Santa Rosa. The Sonoma County sheriff's deputy who fired the shots that killed a 13-year-old boy carrying a replica assault rifle last week is a firearms expert, Iraq War veteran, and a regular contributor to magazines and blogs, where in one article, he wrote about needing to have a "mean gene" to stay alive in the "kill zone." The Santa Rosa Press Democrat first reported the name of the deputy as Erick Gelhaus, 48, which was confirmed to NBC Bay Area on Monday by Assistant Sheriff Lorenzo Dueñas. In a November 2008 SWAT Magazine article titled "Ambush Reaction in the Kill Zone," (PDF) Gelhaus wrote that in order to stay alive, you must take action and have a necessary "mean gene." "If you cannot turn on the "Mean Gene" for yourself, who will?" Gelhaus wrote in a training article to teach law enforcement not to get killed while encountering an ambush. Gelhaus' partner, a new hire with 11 years experience, did not fire his weapon, investigators said, and his name has not been publicly released. Gelhaus and the other deputy were placed on paid administrative leave. Sheriff's officials said he has never fired upon a suspect before. Gelhaus did not return repeated calls to the Press Democrat for comment. Gelhuas’s identification comes after Andy Lopez was killed Tuesday afternoon, a few blocks from his Moorland Avenue home. Andy had been walking near a field with a replica AK-47. At least one witness, Ismael Mondragon, told NBC Bay Area that he had seen Andy with the gun, and told him to put it down because police were behind him. Just after 3:14 p.m. that day, Gelhaus opened fire when he saw the 8th grader -- his back to the deputies -- begin to turn toward him, the barrel of the BB gun rising, the Press Democrat reported. Gelhaus fired eight times. And Andy’s body was struck with seven bullets, the coroner stated, which were shot within 26 seconds, according to a timeline provided by the Santa Rosa police, the agency conducting the investigation into Andy’s death, along with the FBI. Andy's death has divided the community and beyond. Some are backing the deputies, arguing that no one should walk around town with a rifle - real or fake - and should heed an officer's commands. Others are holding regular vigils with community members outraged that a young boy with a toy gun was killed. Gelhuas, a deputy since 1989, has worked in patrol, gang enforcement and drug investigations, according to a mini profile at the Gunsite Academy. His profile lists him as an “avid hunter” both in North America and Africa, who teaches people how to shoot pistols, shotguns and rifles. On his LinkedIn profile, Gelhaus lists that he worked for Aimpoint, the U.S. Army/National Guard and SWAT Magazine, and graduated from Santa Rosa Junior College. He also was a regular writer for Modern Service Weapons, where his last post was on Oct. 14, and discussed the concerns over reloading ammunition. And a company called 10-8consulting.com, which provides small arms training, lists Gelhaus as a senior firearms instructor who returned from the "Global War on Terror" in Iraq where he led an infantry squad. None of these online sites returned a call for comment, or released a photograph of Gelhaus, which they display on their own websites. Sheriff's officials had previously declined to release the deputy's name, citing threats to his safety. Dueñas told the Press Democrat that the office was still dealing with those threats and would, if necessary, take measures to protect Gelhaus. He said the decision to confirm the deputy's name was based on an awareness that it was starting to circulate publicly. In 2004, the Press Democrat wrote Gelhaus was awarded the office's Medal of Valor for pulling occupants of a burning vehicle to safety.